Serdecznie witamy w żółtym domu! Here in the south-west of Poland we raise Koniki Polskie a robust breed of small horses. We provide a basic working with horses, starting with understanding and contact. 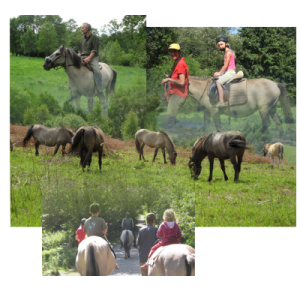 With our horses we can take wonderful horseback excursions. You can stay in comfortable guest rooms or rent our small house. For large events, we have a 88 square-meter hall. We cook and serve delicous food from local markets and our garden, which provides us with plenty of fresh fruit, vegetables and herbs, additional milk from our goats and cheese.